Is There More Upside Ahead? Stocks closed at a fresh cycle high on Friday as the S&P 500 has been enjoying a 7-day win streak, which is the longest in 18 months. Don't look now fans, but the venerable blue-chip index is now just 38 points or 1.3% away from its all-time high. And unless the upcoming earnings season provides a big downside surprise, it appears that the old high is acting like a magnet. Yet, at this stage of the game, a lot of folks are concerned that stocks have gone too far, too fast and are now "set up" for a fall. But then again, these same folks have been singing this song for a couple months - and a couple hundred S&P points. And while stocks are clearly overbought and the S&P is either quickly approaching or has already exceeded many Wall Street firm's year-end targets, some argue there is still room to the upside. One such upbeat analyst is Marko Kolanovic. Mr. Kolanovic is a Senior Analyst and the Global Head of Macro Quantitative and Derivatives Strategy at JPMorgan. Cutting to the chase, "the man who moves markets" (as dubbed by CNBC's Fast Money gang), Kolanovic says that new highs are coming soon. To be clear, I don't listen to very many interviews on the financial networks. I learned a long time ago that in order to be successful in this business, you have to make your own decisions. And since most folks that show up on TV provide little more than their personal opinions on what is going to happen next (often with very little in the way of facts or research rigor), #OnMute is my modus operandi. However, when Marko Kolanovic is interviewed on TV or writes a blog post, I sit up and pay attention. Why? Because his research team covers something that is difficult to come by; namely, what the big boys and girls (i.e. the hedgies and systematic traders - the "quants") are doing with their portfolios. I have long believed that in addition to focusing on my market models, the economy, and the primary market trends, it is important to understand what the major players in the game are doing, and why. But first, you have to know who the players are. In the early 1980's, the "institutions" such as pension funds, banks, and insurance companies dominated the stock market game. Starting somewhere in the 1990's, the mutual funds became the big players. And today, it is important to pay attention to what the hedge funds and "systematic traders" (think risk parity strategies and all the variations thereof) are doing, because these are the folks running the algos that tend to move markets. Marko Kolanovic's team studies these quant traders. And the bottom line here is that relative to historical averages, these players are currently underinvested - big time. Kolanovic notes that according to his team's research, hedge funds' "beta to equity" - meaning their net exposure to the market after the short positions are factored in - is very low. As in an all-time low. Yep, that's right, while stocks have been ramping, the hedgies have been "playing it safe." And given the shellacking stock market investors received at the end of last year, this makes total sense. Those players who "hedge risks" did their jobs. But apparently, they've been slow to pivot. As for the "systematic traders" - those players utilizing computer-driven allocation and trading strategies - Kolanovic sees a similar situation. The JPM analyst says the stock market exposure of systematic traders is currently only 30%-40% of their historical average. While it sounds amazing that some of the market's big, dominant players have been caught flat-footed by the V-Bottom and this year's relentless rally, the data from Marko's team appears to confirm this fact. As such, Kolanovic argues there is plenty of fuel to keep the uptrend's fire burning. To me, this is VERY important information. This helps "esplain" why this rally has refused to yield. Why there have been no pullbacks to speak of. Why the dips - including the intraday dips - have been bought. And why it has been tough to "get in" if you were silly enough to manage the risk of Q4's market debacle by raising some cash. So, while the major indices could certainly pull back and perhaps test the breakout above important technical levels such as the S&P's 200-day moving average, it will be important to watch the action during such a dip. Unless the fundamental backdrop changes (as in economic growth expectations, inflation, or rates), my guess is that the big players will continue to reallocate funds to the stock market. Well, at least until the "Sell in May" season comes around - LOL! There were three positive change to the "Primary Cycle" board this week. First, the Risk/Reward model upticked into positive territory (by a smidge). Next, my "Desert Island Model" improved to neutral (by the skinniest of margins). And finally, the Global Risk Model managed to break into the green zone (again, by a hair). The bottom line is the overall message from the board is much improved. And from my seat, this means the risk of a meaningful decline (i.e. something more than a garden-variety pullback) is reduced. This week's mean percentage score of my 6 favorite models advanced to 58% from 49.5% last week (Prior readings: 47%, 50%, 47.9%, 45.4%, 40.3%) while the median improved to 65.9% from 50% last week (Prior readings: 50%, 50%, 50%, 46.3%, 42.5%). 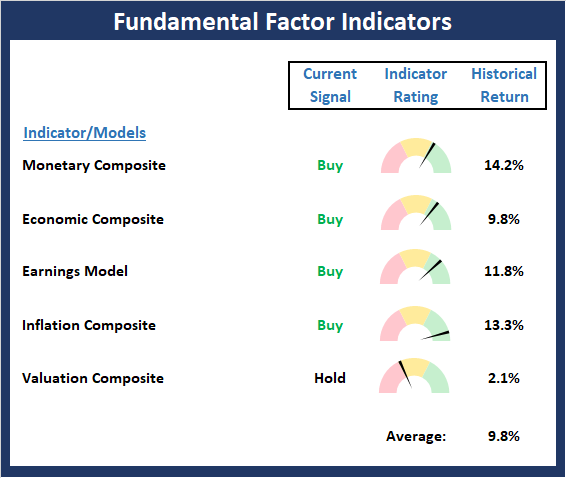 The Trend board scores a perfect 10.0 this week as all the indicators are positive and all are on buy signals. 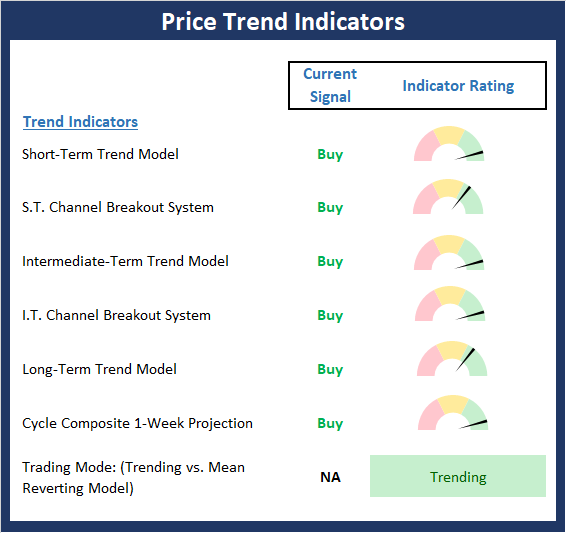 Even the Trading Mode model has managed to confirm that the indices are now in a trending environment. 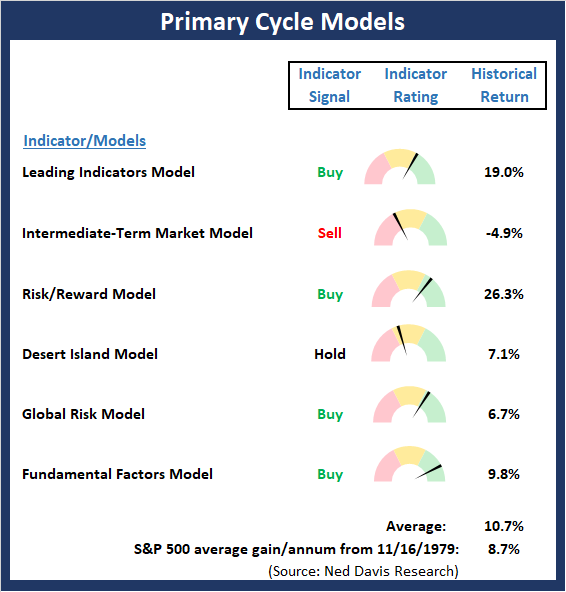 While on the surface, this may appear to be a "late" signal, the "mode" model isn't designed to issue buy/sell signals, but rather to confirm which type of environment the market is experiencing. So, with the model now having flipped to "trending," investors may want to shift to a set of strategies favoring trend-following as opposed to a mean-reverting approach. 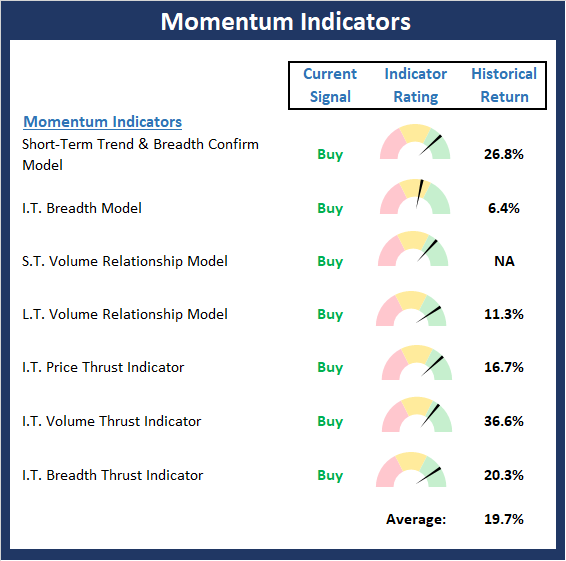 The Momentum board is also in very good shape here with all 7 models on buy signals and an historical return pushing 20% per annum, which is nearly double the historical trend. As I've been saying, the big takeaway from the strong momentum readings is this remains a buy-the-dip environment. 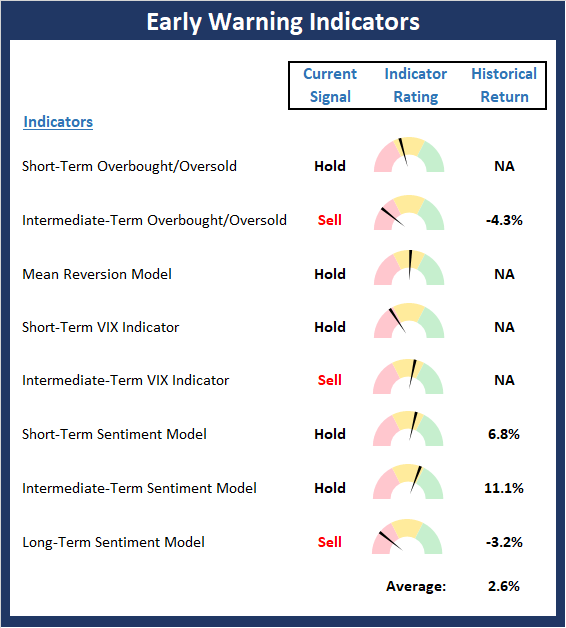 The Early Warning board continues to act as a warning flag as none of the indicators are on buy signals at this time and there are no positive readings. Thus, I'm going to suggest that the table is in now set for the bears. The stars are not (yet?) aligned for a counter-trend move, but the environment is becoming ripe for one. There was one improvement on the Fundamentals board this week. As we noted last week, the Monetary Composite continues to improve and this week moved up into the positive zone. All in, as I've been saying, I believe the Fundamental board continues to favor the bulls. Advisors are increasingly turning to outsourcing to create more time for client-facing activities and to bring additional experience/expertise to their firms. We believe traditional asset allocation has failed investors and advisors alike since the turn of the century. HCR believes in a modernized approach to portfolio strategy. HCR's investing strategies strive to reduce exposure to market risk in times of extreme stress and to participate in market gains when the bulls are running. © COPYRIGHT 2019 Heritage Capital Research. All Rights Reserved.